I think most people are following bearish counts at this point which calls for another wave down to 1010. But given the fact that sentiment is too bearish and the market oversold, I think it's a good time to re-evaluate the options in front of us. 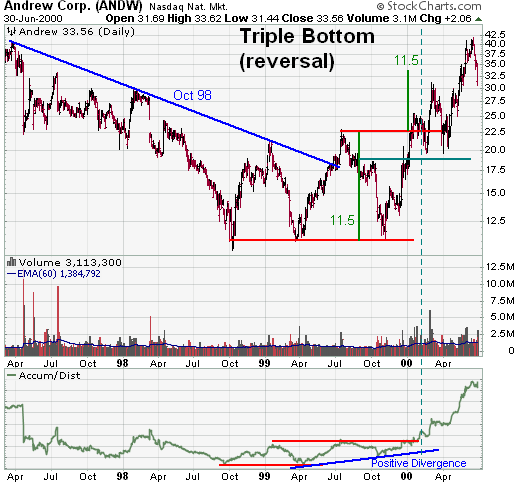 I will let the charts speak for themselves as opposed to "speaking for the charts". I posted the count I've had since July. Note that there are no Minor wave labels as I trade Minute waves. What I am seeing is the possibility for a big rally tomorrow, where this rally will end is the million dollar question. 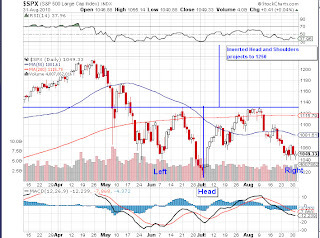 If the wave tops around 1060's area, then we have a set up for a Head and Shoulders projecting to 1025. However, if it keeps on going then we're probably going to see a real rally. And of course, there is the V wave count that a lot of bears are counting on which would call for the market to drop hard to the 1010 area. Personally, I am long on my FXI hedge taken at 1070 and all cash as I am waiting for a good swing trade set up before committing to overnight positions. 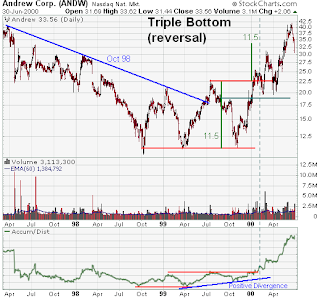 As for the bullish scenario (and at this point what I suspect is likely), I posted earlier today a Triple Bottom Reversal pattern which we might be experiencing. 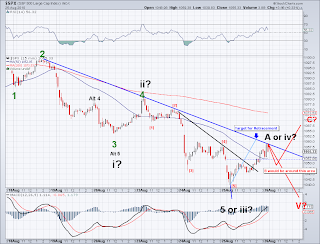 So this Wave IV that a lot of people are trading can be indeed a reversal instead. And last and not least, be mindful that there is an inverse Head and Shoulders with a target of 1250, which would go with the Bullish Primary 3 count. With all this said, I remain bearish and will go leveraged short at the right moment. But it's always good to see what are the alternatives and not get too invested in any particular count. 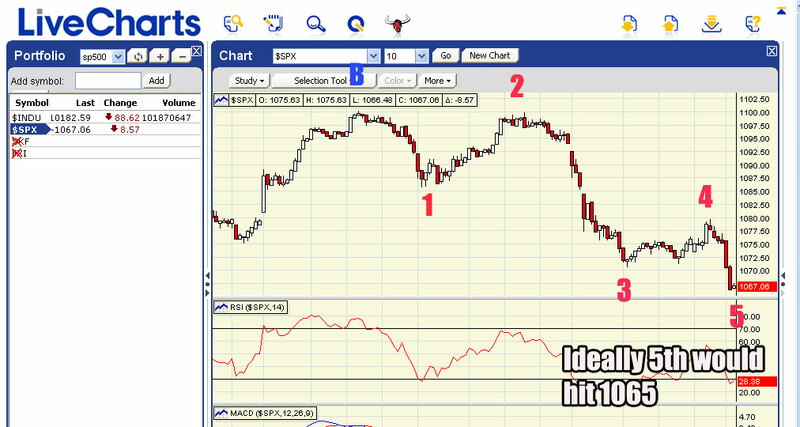 I entered a leveraged long position in the morning at 1041 and I sold half position at 1050. So now I am holding the other half with a stop at break even (1041) and my FXI position taken as an hedge at 1070. I am planning to short again when the count becomes clear. If today's low holds, this would raise the probabilities that we are indeed in a reversal so shorting without being certain of the wave count would not be a good idea. The market ended at hitting the lower price channel so we should see a bounce tomorrow if the rally from Friday was real. Currently the market is oversold and today's down day was in light volume so there will be seller's exhaustion sooner rather than later. I covered all shorts at 1055 and hold 80% of Portfolio 1 in FXI. Portfolio 2 is now in cash. 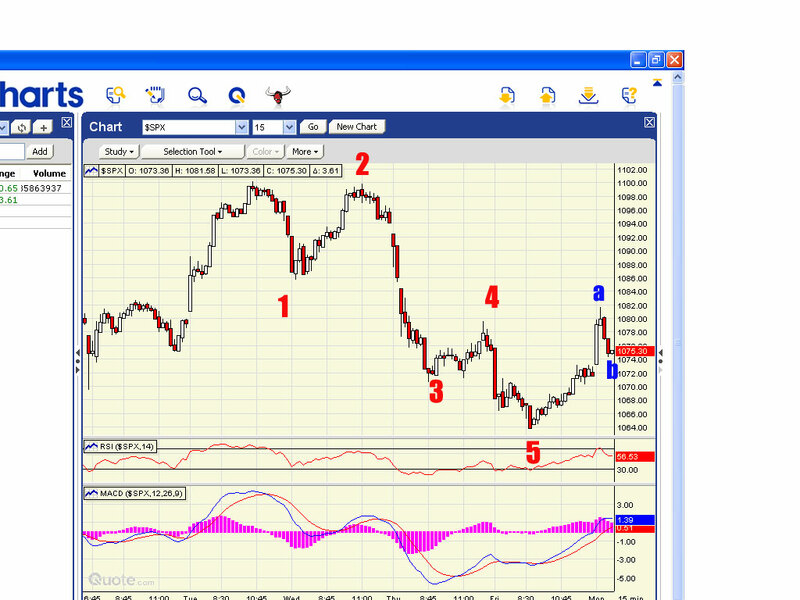 As for the wave count, I will call this wave an X and consider it corrective until proven otherwise. If we see the high of the C wave taken out we are probably on our way to the 50 MA (which is what I am expecting), if we go down hard tomorrow and take out the 1039 low, then we're probably see a 5 Wave down to test 1010 and which I will short on a Wave 2 retracement as today's wave would be labeled a W1. Covered all shorts taken Friday (1060) exactly at the 38.2% retracement at 1055.50. 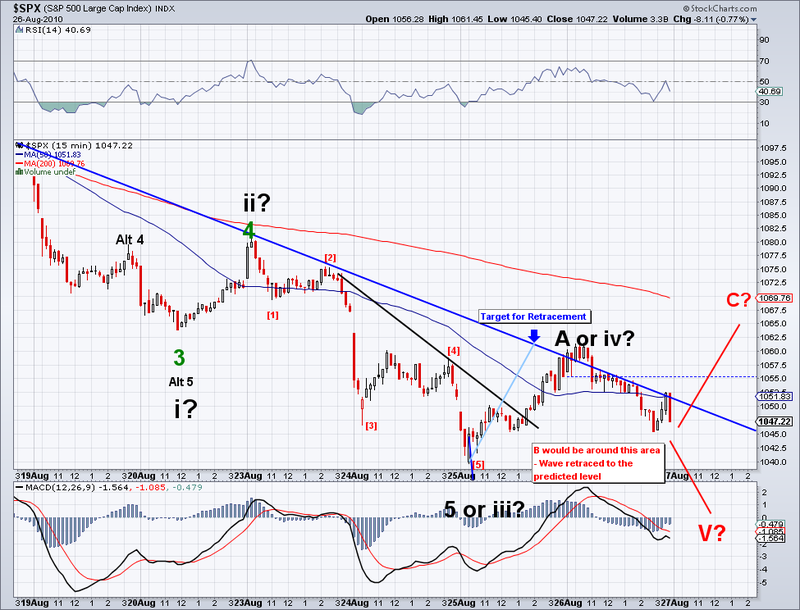 I have no idea what wave this is but my guess is that we are going higher as this one looks corrective. 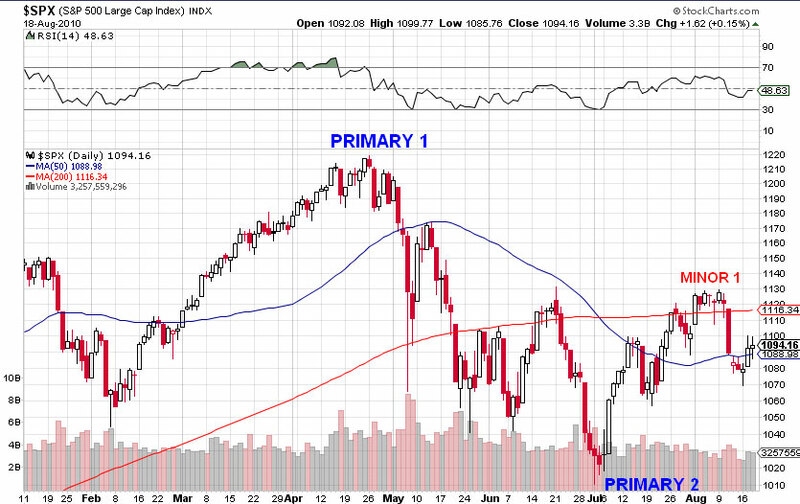 I am expecting the market to challenge the 50 day MA. One of the best lessons I got from being a subscriber to EWI was not to take any count too seriously(after following their official bearish count on a massive bullish rally). I covered all my shorts yesterday and kept my FXI long hedge because I wasn't sure of the waves. My count pointed to an ABC move to where we closed today but almost every single count I saw (with the exception of one other waver) had a 5th wave of a III to break the 1040 support. And being conservative worked out well today as this "C" wave throws a wrench in most waver's count. The rally we saw today has the strength to become a real rally, so I am expecting a further rally to challenge the 50 day MA at 1086 once it's done retracing. I am not sure of the exact labels for the Minute count so I am going mostly by Technical Analysis at this point. 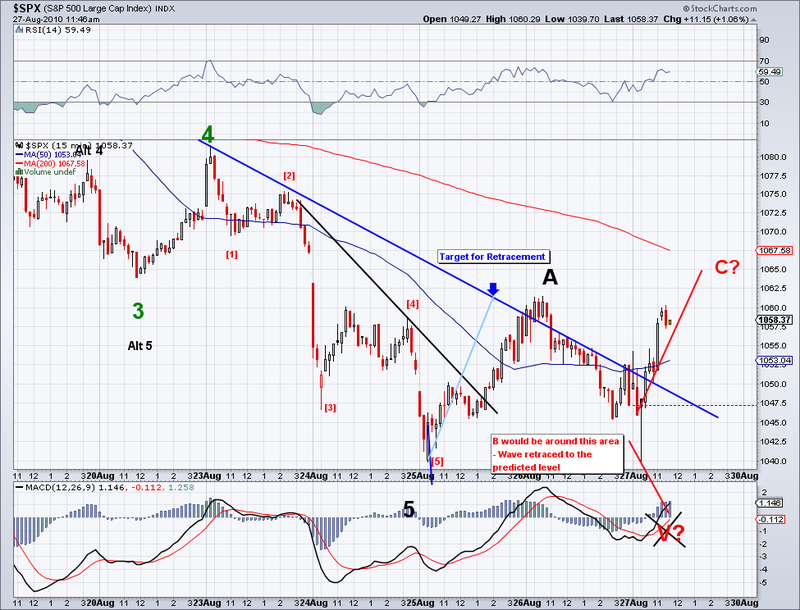 I took a 1/2 short position at 1060 (the one I sold I sold at 1053) and I will sell at the retrace of this "C" wave. So it turns out this was an ABC move after all as I had been suspecting all along. 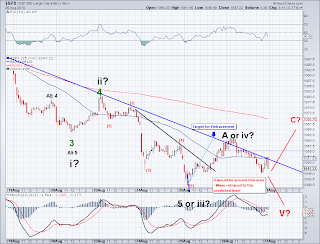 Now the question remains if this is an ABC for a IV wave or the beginning of a counter rally. I am on the sidelines as per my comments yesterday, I rather lose a trading opportunity than money in my account. Right now it looks like the C wave will challenge the 1065-1070 area and that is where I will be shorting and selling my hedge. I exited all all shorts and kept my FXI hedging position. The count is conflicting so I rather miss an opportunity to trade than lose on a trade. I covered all positions from 1055 at break even and the remaining 1/2 short position carried from 1098 at 1053. I should also add that there is an inverse Head and Shoulders with the low today forming the right shoulder and this projects to 1075-1080. Tomorrow morning we'll have a clear answer to this wave. Since we will have the GDP announced, I would assume the expectation for bad numbers is built in the market. However, the market might sell off (for the V wave) if the numbers point to an obvious economic slowdown that will lead us back to recession. 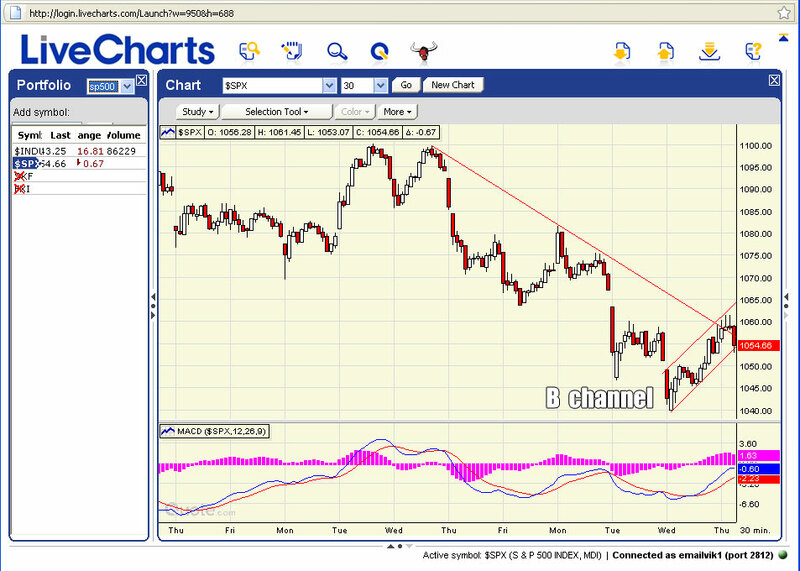 If the Channel holds we will probably challenge the gap in the upper 1060 area. If not then we're on to 1039 again. I ended buying back the short positions I sold in the morning at 1055. I think there is a bit of confusion as to which Minor count is correct thus I am debating whether if today an A wave ended at 1059 and now we're on to B or this was an W4 on the aggressive bearish count. To be safe I will be adjusting my stops to break even as soon as we get a Fib retrace. 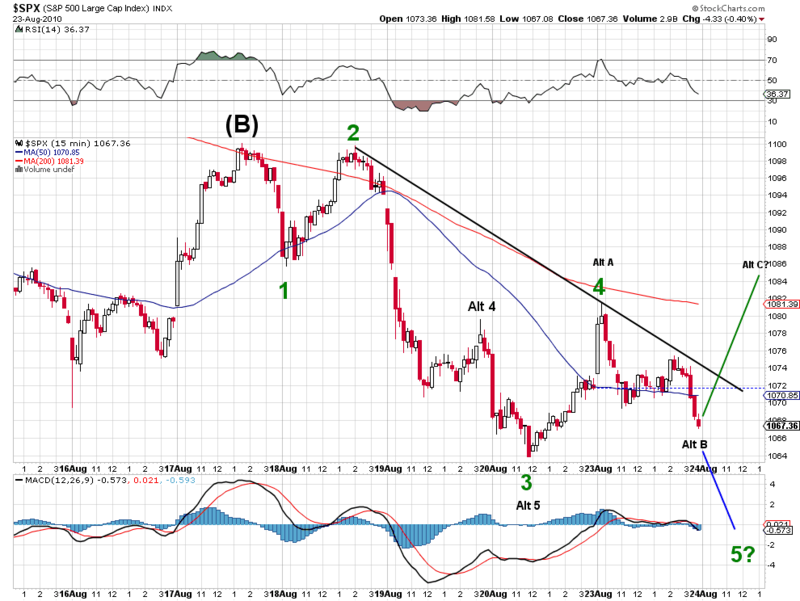 If this is a 5th then it will most likely be impulsive towards the sub-1040 area. 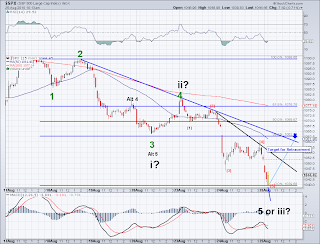 If this is an ABC, we'll see 1059 taken out after the B retrace. Covered 1/2 shorts at 1041 and bought them back at 1055. Covered all shorts at 1042 and bought them back at 1055. As an aggregate the combined return is aprox 16% since inception 07/2010 vs -1% for the S&P 500. Covered 1/2 of portfolio 1 at 1041 and all of portfolio 2 at 1042. 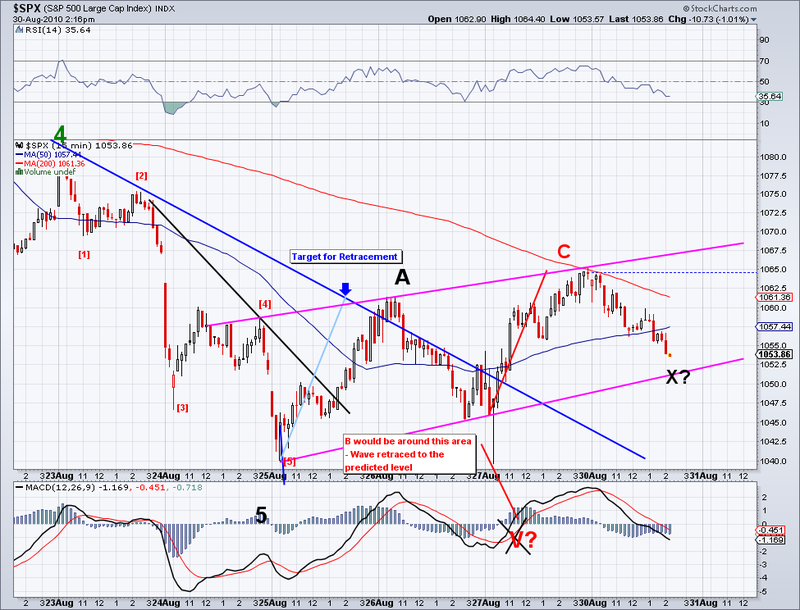 Right now it seems like we are done with the 5th wave and we're on to the retracement area in the 1062+ area. I expect the market will challenge the gap down from yesterday. Will update EW portfolio returns later. The better known count going around is the one that calls for today's wave as third wave of a III with minuette  playing out. But I posted an alternative count that reads this wave as an extended Minute 5 wave of Minor 1. We should be able to tell which count is correct in the next few days but right now the trend is clear, we're on the way down. 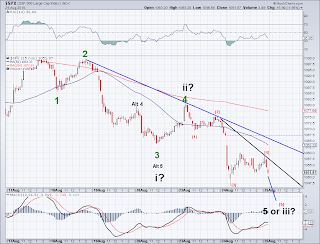 iii Wave or 5th Wave? I think we'll have the answer depending on how 1040 holds. I ended up buying back my 1/2 short position at the close at 1067. 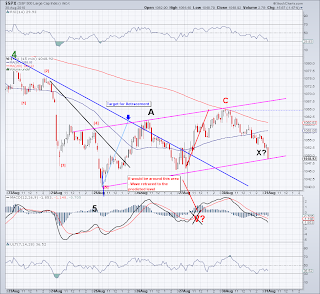 I figured if I am wrong on the ABC count, I will be 200% leveraged on the way down. 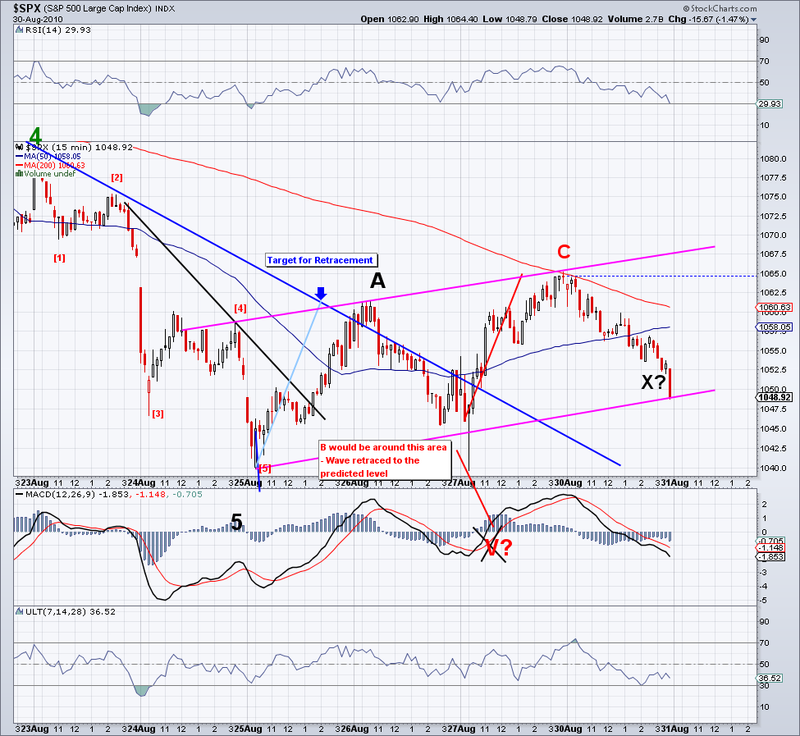 But if the ABC is correct, I will sell my FXI hedge in the 1085-1090 area and have a nice profit cushion to trade with. Given the fact that home sales numbers are coming out tomorrow and they are surely going to be horrible, this will give an excuse for people to do more selling. Seems like we will reach the 50 day MA based on this count. I bought back 1/2 short at 1079 and sold it back at at 1075. And will buy back at 1089 or the first sign of topping. So we got to 1065 after all and I sold 1/2 of SDS position, which leaves me technically speaking 100% of my cash portfolio short. In addition, I went on margin and placed 100% of the portfolio value in FXI. Bought all FXI I sold at 40.90 for 40.36. Sold 1/2 short position with cost basis @1098 (technically 1113 adding the position trades omitting FXI contribution) at 1065 for a 33 point profit. Raised stop loss to 50 day MA which is 1089 at the moment. Combined performance since Inception Date July 21,2010 = 12.5% vs 0% for S&P500 (traded at 1070 that day). 5th wave about to be completed? 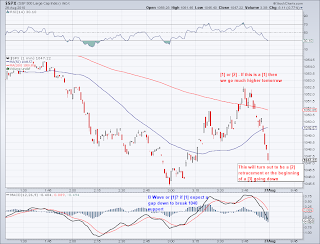 I am hedging with FXI and maintaining a 200% short position. 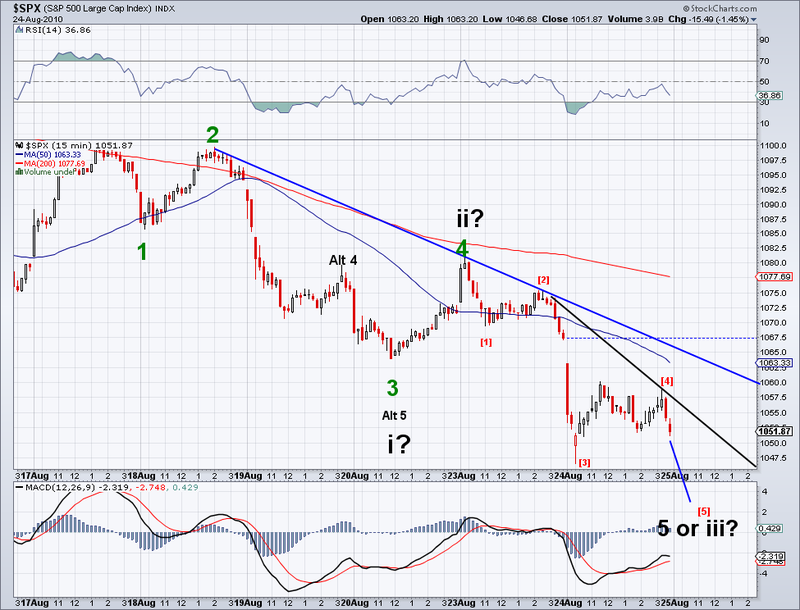 I was trading yesterday's wave as an ABC and was expecting C to take the market down t0 1086. But given the impulse today, this wave might actually be a W1 and as I speak I see the minnuette w3 bottoming at 1070 and now we're working on either a w4 of this W1 or W2 itself. I am 200% short from 1096 and I've raised my stops to break even. My EW Portfolio is up more than 10% since its inception in early July vs exactly 0% for the S&P. As most of you know, I am currently bearish and I don't think there is anything on the near term that would change my mind on a technical or fundamental basis. However, as a trader one must keep in mind different possibilities that might arise and the count above is one that I keep in mind (especially now that I am 200% short). The market could go very bearish or very bullish in the next few weeks so is always good to keep that in mind and manage risks accordingly. 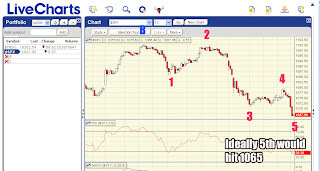 Today I gained 3 points on Portfolio 1 by trading positions. I currently believe we're on a C wave with A=1100>1086 B=1086>1099 C=1099>??. The C could well turn out to be a W3 of course or it could be part of an Ending Diagonal. Whatever the real count is, I am watching for intra-day movements and I will be day trading in and out but staying short overnight. 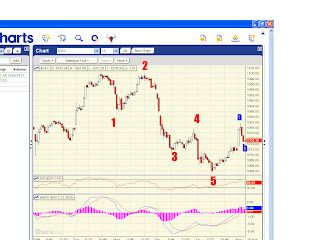 Wave 4 has been invalidated on the DOW. 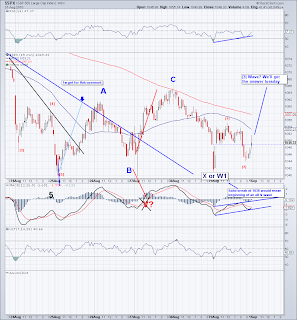 Therefore I think what we saw (1100>1086) as a A (alt W1 of an A) and now we're on a corrective B (alt W2 of an A). Portfolio 1 Update: I covered shorts at 1088 and bought back at 1091 for a net 3 point gain on 200% position. So that brings up my short cost basis on my position taken yesterday to 1098. China's leap over Japan recently as the world's second biggest economy made headlines this week but China has been growing already for over 30 years at rates never seen in any other major economy in modern times. 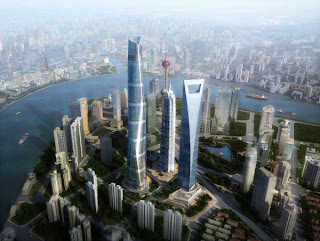 And in a decade or two China's economy will take over the US as well and if we use the correlation of stock markets and the size of an economy, it means the Chinese stock market will likely be 100% of their GDP by 2020-2025 or basically 5-6 times its current size thus providing an excellent hedge opportunity for anyone shorting advanced markets or just as a long position trade. 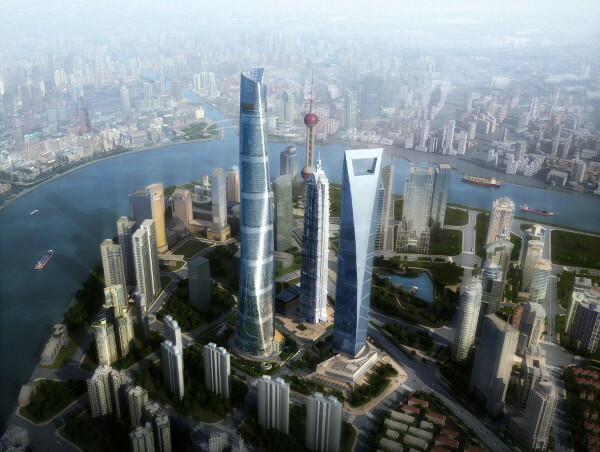 I have been following the Chinese economy since the early 1990's because China was my favorite subject for marketing and research among emerging markets. Back then, China was 8th in world trade and the size of the their economy was roughly the size of Canada's or basically 1/1oth of what it is today. I remember presenting my research to my International Marketing professor whom at the time was somewhat surprised by the projections for growth I had come up with. But now, China is on everyone's radar and that translates into a multitude of opinions from skeptical to extreme bullishness on the Chinese economy. However, just like I had my projections for Chinese trade for year 2000 in 1094, my projections for the Chinese economy puts it as the largest economy in the world in the 2018-2022 timeframe. The math at this point is very simple, China's GDP stands at $5 trillion (and its currency is undervalued, meaning it should be higher) and the US GDP stands at $14 trillion. If China continues to grow at 9% a year as it is projected to do in the foreseeable future and the US grows at 2% a year combined with a 30-40% currency appreciation, that would put China and the US as equals around the timeframe mentioned with China eventually surpassing the US. Obviously, there are obstacles and challenges ahead like a second world wide recession, a very prominent Chinese real estate bubble, etc. But just consider the challenges China faced in 1978 when it first implemented capitalist reforms, it's economy was in shambles and was experiencing Sub-Saharan levels of poverty, nobody could have then predicted the Chinese economy would grow 9000% in 32 years time and become the second largest in the world in such short period of time. 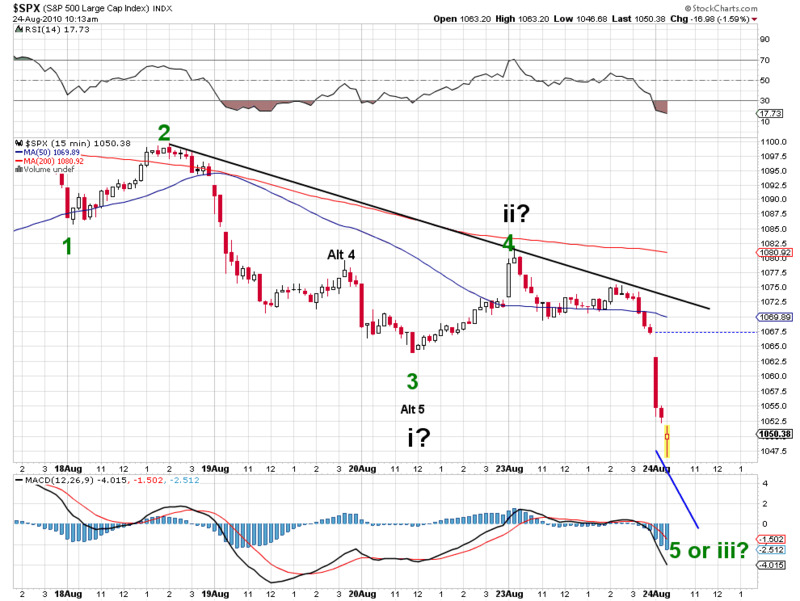 Now, some might be asking why I decided to write about China on an Elliott Wave Trade site. 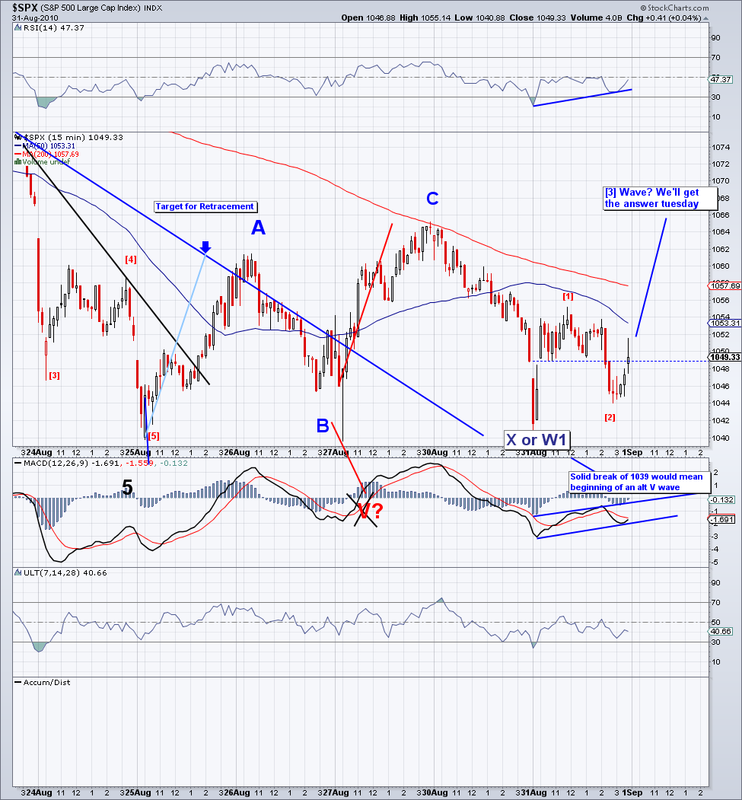 And my reason is that I believe China is currently experiencing the beginning of Wave 3 or still working on Wave 2 on a Cycle wave in a Grand Super-Cycle Wave 1, with Cycle Wave 1 topping at Shanghai 5903 and Wave 2 possibly bottoming at Shanghai 1747. 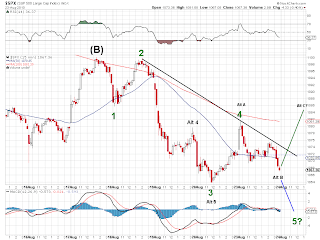 What this means to Elliott Wave Traders is that we can trade Chinese shares or ETF's long with a certain level of comfort knowing the way is up or we can use Chinese shares as hedge for traders who short more advanced markets. 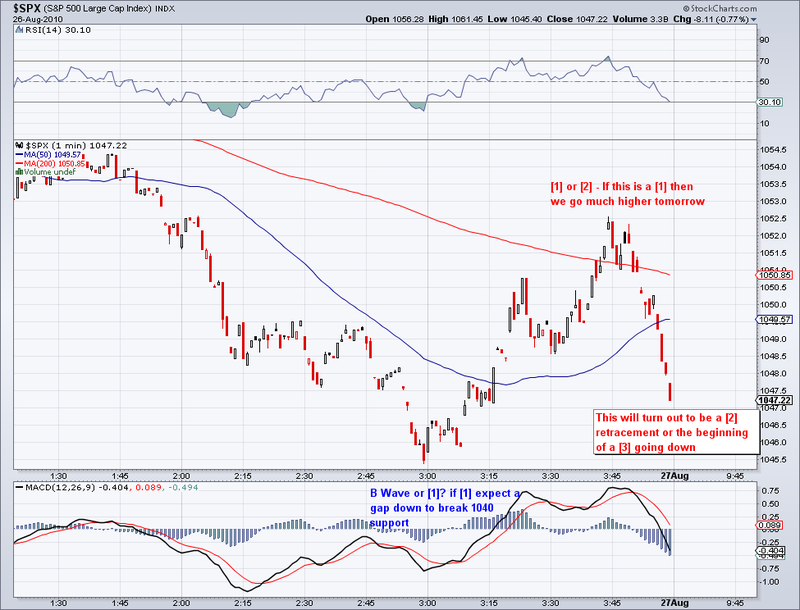 I will post a count for the FXI (The most traded Chinese ETF in US markets) in near future. 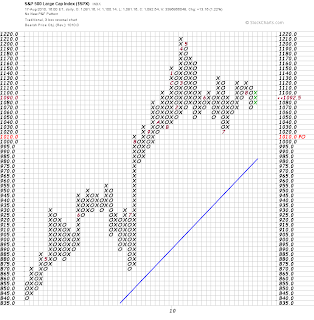 Based on my count, the retrace from the high today of 1100 to 1092 is W4. I sold all longs and went short at 1095 and 1096 which were in my target range. I missed the minuette W5 on the W3 but it's ok. So tomorrow we can probably finish this counter-rally business with a finally pop to the 1100-1110 area and then we will see if the bearish count is right. 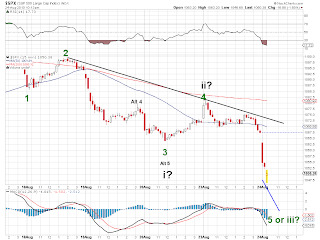 From analyzing several technical indicators and counts, we do seem to be setting up for a cascade type of sell off which is in line with the Minor 3 count that will take us to the low 1000's or maybe even 900's. 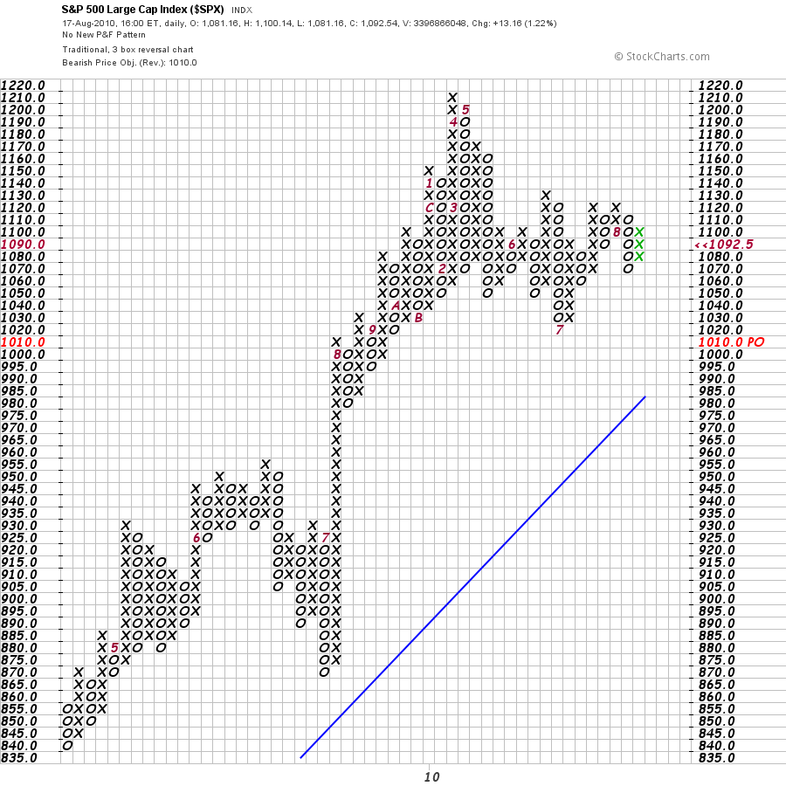 Below is a P&F chart that also points to the same target. 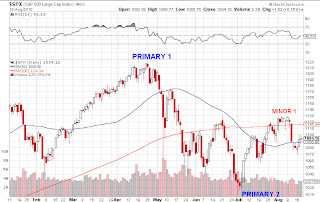 While I am not so sure we are in Primary 3, odds are that we will see a Minor 3 impulse to the downside in the next few days. The market reached the 34 EMA which was my main target so I sold all my longs (for a nice profit) and I went 200% short on both portfolio. I think we're seeing a counter rally but I will be watching my stops carefully. Seems like the Minor wave that started couple of weeks ago is now finished with the low at SP 1069 (4 points shy of the 1065 target). And now we've had the A at 1082 and working now on the B. Therefor if A=C and the low of B is at 1075, then the target for a corrective minute wave would be 1088 or exactly where the 50 day MA is at. However, considering the minor wave proper retracement, I would assume a C wave would take us above 1090 and all the way up to 1103. Therefore, the strategy should be to start going short at the 38.2% retracement mark with a stop at the 200 day MA at 1116. 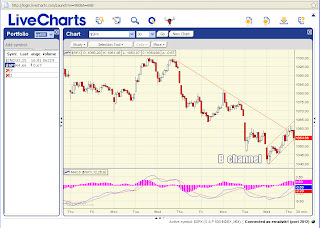 SDS sold at 1080; profit 45 points and waiting for the 38% retracement to buy back position. 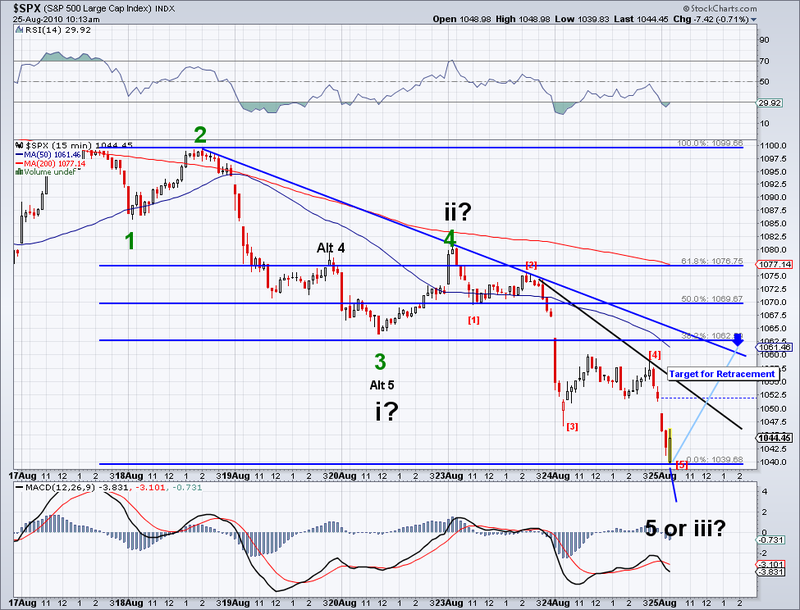 By looking at the chart, I get the feeling this is a W4 with a W5 coming that will take us further to the downside. However, this W4 might fail as well so I am not taking any new positions until either we get a retrace (go 200% short) or get to 1065 (cover all shorts). Perhaps we'll get the answer by the end of the day or on Monday. 1 - 5 waves ended at 1076 and today's high at 1087 was A and we are currently working on B or starting C to the Fibonacci retrace. 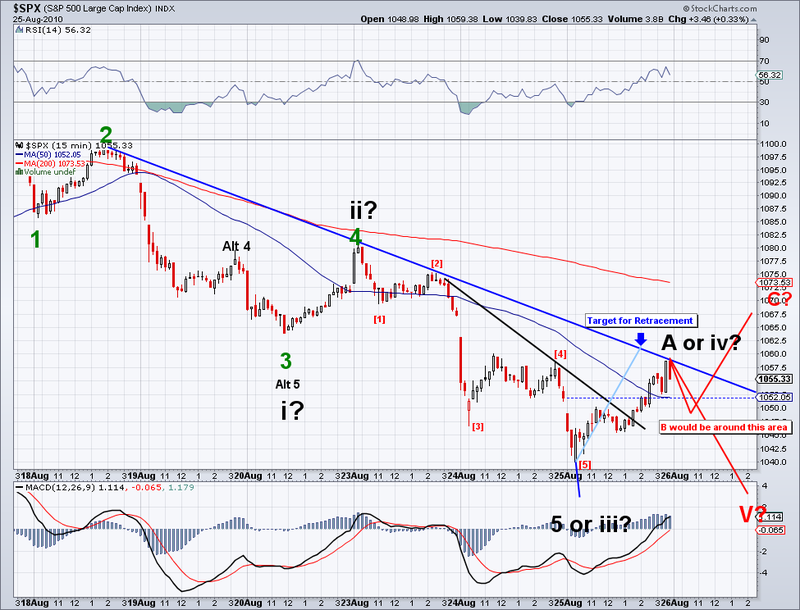 2 - There were 5 waves down on a W3 and we are now on W4 with a W5 target of 1062-65. I sold another short position at 1080 and that netted me 55 points on 2000 shares of SDS and went long on FXI but got stopped out at break even on a backtest of today's low. 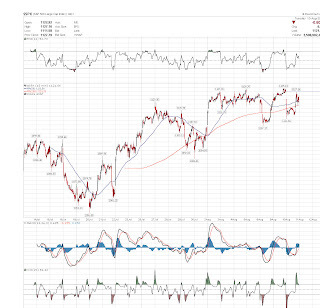 I am currently holding 3000 SDS from 1125 and FXI long at the 1090 level to hedge. I waiting on the retrace to buy a total of 5000 SDS and sell all FXI. SDS net 9 points. Unrealized SDS (52 points), FXI - 7 S&P 500 points. Sold SDS and added FXI at 1081. It seems like 5 waves down ended at 1076 this morning and we're in the process of starting a counter rally. 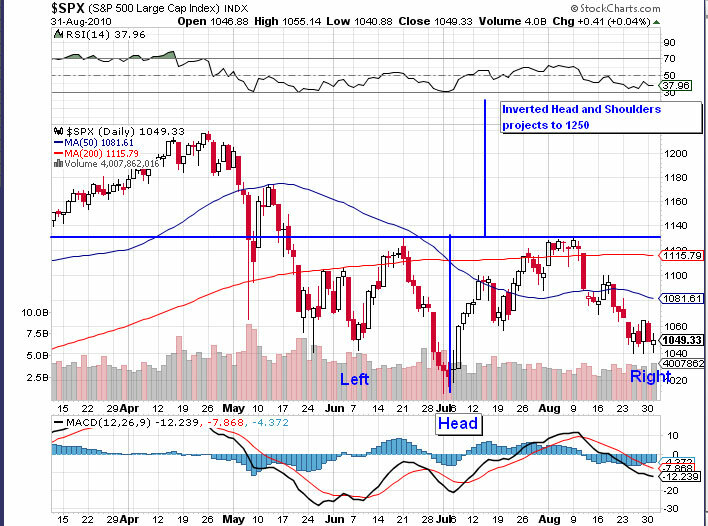 I could be wrong of course and the market could extend the 5th wave to test 1062-64. If the gap closes then it should confirm an "A" and the end of the 5th. I am hedged and in positive territory this morning and will sell start selling longs on the 38.2% retrace and buy back the 1/2 short position I sold yesterday. 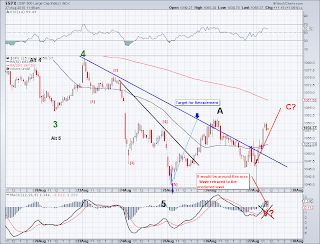 Bought FXI at 40.19 to hedge short position on the retrace. We're close enough to the 50 MA (1088) so I sold the 1/2 short position taken at 1099 this morning. I am looking to buy back this position on the retrace which I think will be in the 1103-1108 range if the low holds. There is the possibility of the market testing the low-mid 1080 area which would bring down the Fib retracement. I am holding on to my other 1/2 position @1125 short from yesterday. I am starting to wonder how many 5th waves fail. There have been several as of late and since 1131 (what was a somewhat easy and obvious target just few days ago) seems like it will not be breached and now we have a set up that will test 1010 at the very least. I went 1/2 short yesterday (100%) because I am now used these 5W failing and will fully short (200% leveraged) on the Fibonacci retrace. 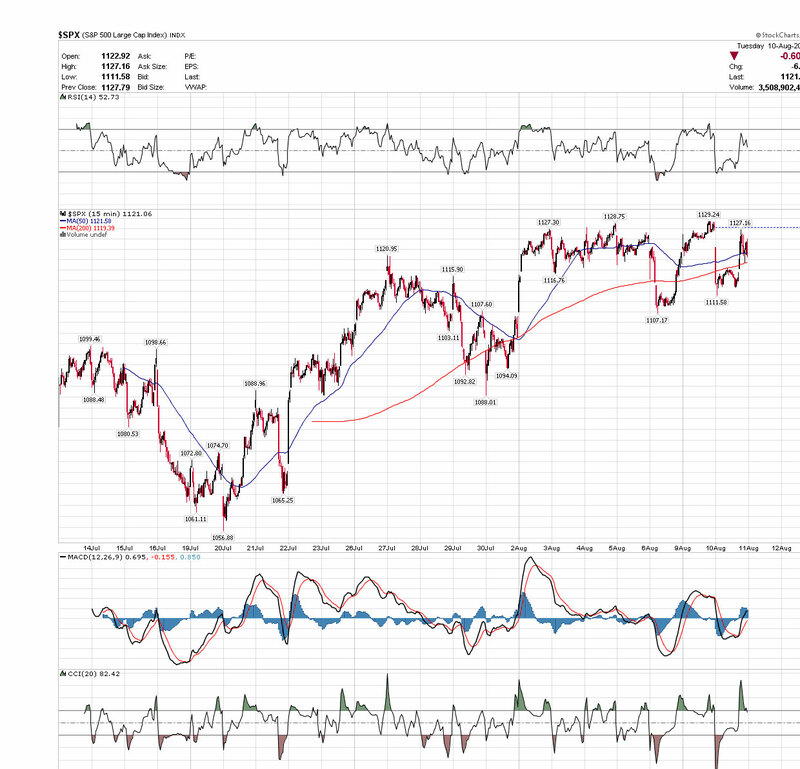 I took half short position today at 1125 and will take another position if we make another high above 1131. 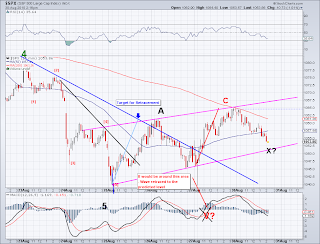 This looks like an 5th wave ending and the market will probably test the 1010 low. At the very least it will have a Fib retracement of 38% so we're looking at the 1080 minimum if the market does not make a new high. I think this is a safer short bet at this point. Also, from now on I will start tracking my Elliott Wave portfolio based on my own formula which is primarily based on short and intermediate term counts plus traditional technical analysis. So I will list today as the start as short half a position at 1125.